In one bite you get the sweet taste of the summer- sunny, joyful, fresh, frisky and flavorful. It’s so good it will make you sing. It’s a pure bite of happiness. 1Cut the eggplant to ¼” thick pieces lengthwise. Lightly salt it and let it rest for 20 minutes. The salt will take all the water out of the eggplant. Pat dry each piece. Over medium heat in a heavy bottom skillet fry each side to golden brown. You can add 1 sliced garlic clove while frying for extra flavor. 2In a mixing bowl combine ¼ lbs ricotta, ¼ lbs soft goat cheese, 2 scallions minced, 1 tablespoon minced parsley, 1/2 teaspoon nutmeg, 1/2 teaspoon freshly ground black pepper and 1 egg. 3Preheat the oven to 350F. 4Place one slice of the eggplant to a cutting board. Place 2 basil leaves and add 1 ½ tablespoon of the cheese mixture. Roll it and transfer it to a small baking pan. 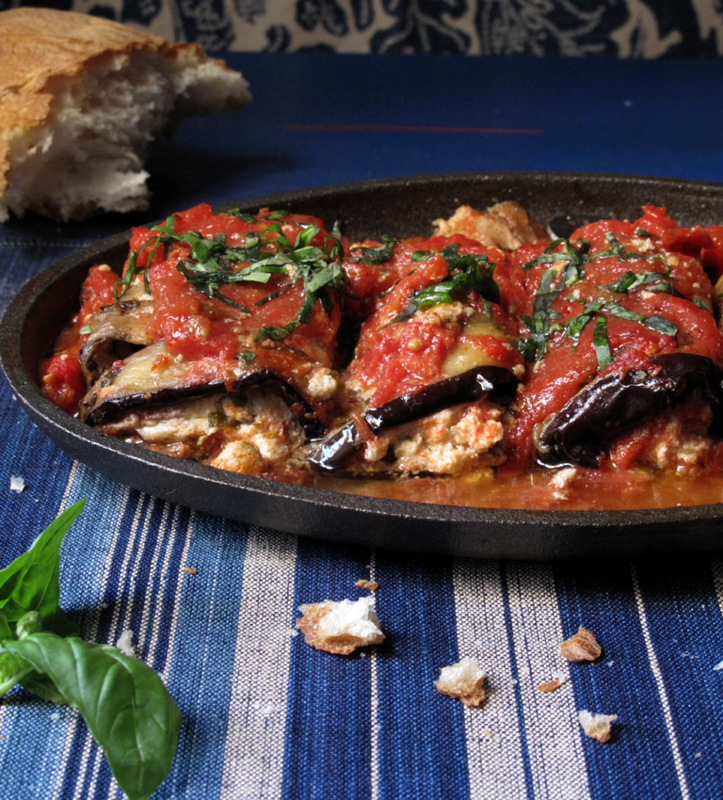 The size of the pan will have to fit perfectly all the eggplant rolls. Repeat the same with the rest of the eggplant pieces. Cover the rolls with 1 ½ cup crushed canned tomatoes and bake in the oven for 25 minutes.